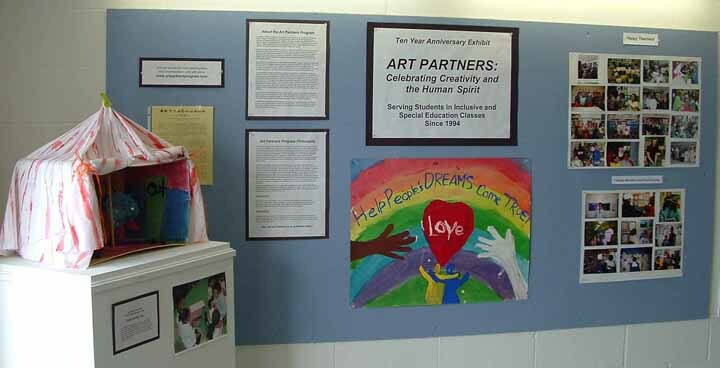 Founded in 1994 by Professor Lucy Andrus of the Art Education Department at Buffalo State College, Art Partners is a volunteer program that brings Buffalo State College students and their faculty instructor together with students attending urban schools for a special program of art experiences designed to enhance learning and personal growth. Art Partners offers students in inclusive and special education classrooms opportunities for viewing, discussing, interpreting, valuing and making art objects. Art Partners grew out of identified community needs to break down barriers by: providing college education majors with early experience teaching diverse student populations in urban schools; providing meaningful art experiences for children and teens with special learning needs who were not receiving art education; and by promoting appreciation, respect and support for diversity among children and adults, students and faculty, and families and schools. Since 1994, Art Partners has served students from BUILD Academy , School 57, School 68 and the Community Based Special Education program at McKinley High School . Rather than providing short-term experiences for a greater number of students, the program stresses an intense, year-long commitment to fewer groups with the intention of making a lasting impact. Over three hundred and thirty children have participated in Art Partners and over one hundred and sixty Buffalo State College students have received specialized training through the program. The community at large was invited to attend the exhibit's opening reception, offering an opportunity to meet our artists, their families and friends, members of the Buffalo State community, and the wonderful BSC students who have made this program possible through their dedication and hard work. The program founder/coordinator would also like to thank our host teachers at the schools we have served, who have been incredibly generous and accommodating in letting the Art Partners teaching team to take over their classrooms every week throughout the entire school year. They are: Kathy Rose, Lois Mesler, Peggy Dolan, Vicki Baxter, Margaret Ando, Richard Gioia, and Brigid Moran. They are inspirational role models for all teachers. The program founder/coordinator would also like to take this opportunity to thank her daughter, Sasha, for helping to teach in the program as well as test out some of the art projects, giving sound advice every time, and for ten years of letting her mom house the supplies and materials for Art Partners in her home without a single complaint! Sasha is truly an Art Partner! This exhibition and its reception is a testament to the power of partnership among diverse groups, to the human spirit to achieve beyond expectation, and to educators who make it their primary goal to assure that learning is accessible to all children through their own thoughtfully crafted pedagogy. Art Partners is based on the belief that all children can learn and that all children can find meaning in art experience. In support of this tenet, the curriculum of the program is based on assessment of student needs, and activities are specially designed to promote identified developmental as well as art education goals and objectives. Integral to the program is to provide students with an alternative form of self-expression and a means for developing personal competence through art experience. Many of our students are met with challenges that may affect their ability to persevere and succeed. What we have learned is that participating in art experience can be empowering as well as healing, and helps kids of all ages to develop positive self-concepts. Art experience gives people a voice they may have not had before and helps them to discover parts of themselves that can rise up to meet challenges. In art, there is no right or wrong answer, only the person’s own strivings to find an answer for him/herself. Grappling with an art problem and finding ways to use art materials and methods to give outward expression to an inner vision encourages the development of higher order thinking skills, while putting control into the hands of the artmaker. We have seen that even for our students with developmental special needs, art experience offers an alternative way for them to perceive and respond to learning, making use of multiple intelligences, and helping kids to beyond the limited expectations often placed on them. We have also learned that it is our job as educators to design ways to differentiate our instruction so that this process can unfold. We will learn about Artworks, Artists, and we will become Artmakers. We will behave like artmakers, which means that as artmakers, we will: think carefully about what we are doing; take risks and try new things; make mistakes for sure, but see these as paths to new learning; not give up when something goes wrong. We will try again! Artmakers use these behaviors which are: Care, Control, and Competence. We will show our care about what we are doing, the things we are using, and the people we are with. We will control our art tools, materials, and ourselves. We will learn to do something well. We will be competent!